German artist Clemens Habicht broke the puzzle mold with his latest creation: Rather than your ordinary landscape or tableau, this 1000-piece jigsaw connects to create a complete CMYK color gamut. Each of the pieces is a slightly different hue, so as you build the puzzle you create a vibrant spectrum. “What is strange is that unlike ordinary puzzles where you are in effect redrawing a specific picture from a reference you have a sense of where every piece belongs compared to every other piece,” he continues. “There is a real logic in the doing that is weirdly soothing, therapeutic, it must be the German coming out in me. As each piece clicks perfectly into place, just so, it's a little win, like a little pat on the back." 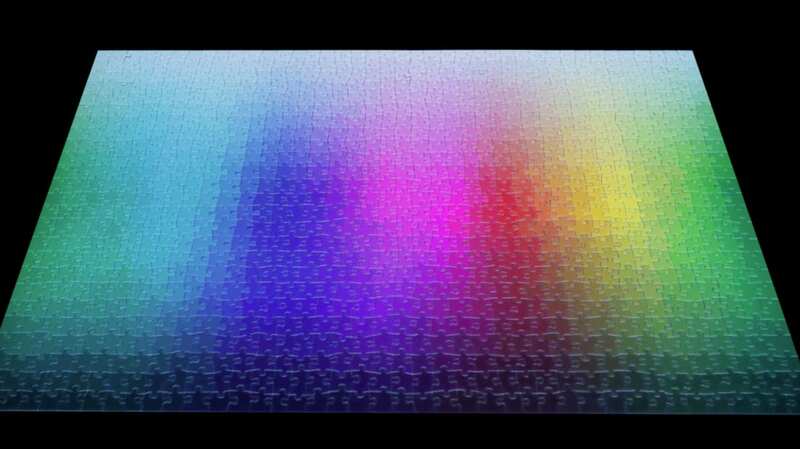 1000 Colours Timelapse - Long from Jacky Winter on Vimeo. Unfortunately, the first run of the puzzle (co-produced with Lamington Drive Editions) is completely sold out—so you won’t be able to get it in time for Christmas. But the second edition is available for pre-order now, with puzzles expected to arrive by January 30.